Static Part: Meaning of Fake news, Beyond Fake News project. Dynamic and Current: Why is the spread of fake news on rise these days, how to contain it, legislative measures necessary, challenges and need for multi- stakeholder approach, how it affects voting behaviour? Context: Outgoing Chief Election Commissioner O.P. Rawat has said that fake news affects voting behaviour in a big way. Political: Swaying or polarising public opinion. Example Recent American election, UP elections where certain facts are quoted out of context/partially. Significant impact on the nature of polity. Religious: Promoting religious ideologies. Glorifying one religion while despising others Ex. Right wing violence meted out by Gau rakshaks leads to religious polarisation and communal unrests. Criminal: Sensationalising crimes by blowing them out of proportion. Misleads people rather than making them aware. Instils irrational fears. Independent, trusted and effective press regulation. Mainstream media must use social media tools intensively in order to defend the truth, present the correct information and balance opinions. Curb media ownership. We need an open debate on the impact of media concentration on our democracy and wider culture. There should be clear limits on media ownership so that powerful proprietors with vested interests are not allowed to dominate the news agenda. Define fake news legally. Heavy punitive measures for whosoever violates the said definition. There should be grievance redressal mechanisms and arbitration spaces to resolve issues. Digital media literacy among people to increase scrutiny and feedbacks of the content. Technical solutions that assess the credibility of information circulating online are also needed. What is it? The British Broadcasting Corporation (BBC) has devised a new campaign that is aimed at fighting back against disinformation and fake news. It lays a major focus on global media literacy, including workshops and debates in countries like India. Mains Question: With the advent of new age digital and social media, fake news has pervaded all spheres of life, political, economic and social – with negative implications. What measures need to be taken by various stakeholders to combat fake news menace? Discuss. Static Part: Transfats- what are they and uses. Dynamic and Current: concerns and the need for reduction in their usage, WHO guidelines, Initiatives in India. Context: The Food Safety and Standards Authority of India (FSSAI) has launched a new mass media campaign in order to create awareness about trans-fats and eliminate them in India by 2022. “Heart Attack Rewind”, a 30-second public service announcement, will be broadcast in 17 languages for a period of four weeks on YouTube, Facebook, Hotstar, and Voot. It will also be placed on outdoor hoardings and run on radio stations in Delhi and the National Capital Region. Trans-fatty acids should not comprise more than 1% of your daily calorie intake. Use heart-healthy polyunsaturated fatty acids (PUFAs) as replacement. Mains Question: A robust and responsive food system is need of the hour to combat undernutrition, non-communicable diseases and hunger around the world. Analyse. Dynamic and Current: Why is malnutrition on rise globally, what needs to be done? India’s position and measures necessary. Context: The 2018 Global Nutrition Report (GNR) has been released. 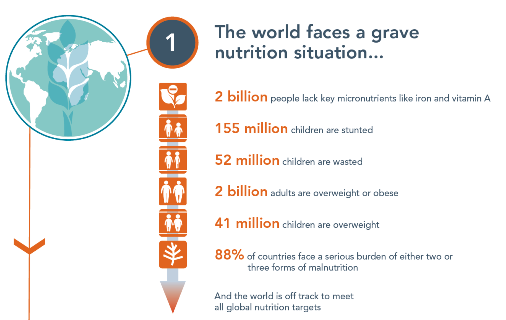 Break down silos between malnutrition in all its forms. Prioritise and invest in the data needed and capacity to use it. Scale up financing for nutrition – diversify and innovate to build on past progress. Galvanise action on healthy diets – engage across countries to address this universal problem. Make and deliver better commitments to end malnutrition in all its forms – an ambitious, transformative approach will be required to meet global nutrition targets. Mains Question: The progress on sustainable development goal impacting child malnutrition has been tardy across the world including India. Examine and suggest how to tackle this problem? Static Part: About G20, Meaning of fugitive economic offender. Dynamic and Current: The proposed action plan- need, significance, challenges and the need for international collaboration. Context: India has presented a nine-point programme to take action against fugitive economic offenders at the ongoing G20 Summit in Argentina. Different types of irrigation and irrigation systems storage. Static Part: Key facts about the project. Dynamic and Current: Issues associated and the way ahead. Context: The Supreme Court, hearing a petition on the status of Polavaram multi-purpose project, has ordered the Centre to hold a public hearing in the project affected area in Odisha and Chhattisgarh. The Centre replied saying it was ready to appoint an independent agency to conduct the same. The objective is to bring a fortnight of intense focus on the issues and practices of Swachhta by engaging GOI Ministries/Departments in their jurisdictions. An annual calendar is pre-circulated among the Ministries to help them plan for the Pakhwada activities. The Ministries observing Swachhata Pakhwada are monitored closely using online monitoring system of Swachhata Samiksha where action plans, images, videos related to Swachhata activities are uploaded and shared.